Spondylolisthesis is a degenerative condition of the spine in which one vertebral segment slips over the one directly below it, causing a misalignment. It is a condition most commonly found in the lumbar spine, due to the wear and tear that this part of the spine is subject to from having to bear most of the weight of the upper body. As it is the most flexible part of the spine, with the greatest range of motion, it is more prone to damage. Symptoms can be practically nonexistent or may show up as severe lower back and/or leg pain. Other symptoms include pain in the buttocks, tightness or weakness in the hamstrings and sciatic pain that radiates down the back of the legs. 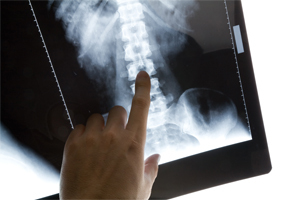 There are a number of different forms of spondylolisthesis, each having a different cause. Activities that put greater amounts of pressure on the lower back due to repetitive stress or hyperextension are more likely to cause isthmic spondylolisthesis, a condition most commonly found in those who use their lower back a great deal, such as gymnasts, football players and movers. Traumatic spondylolisthesis may be caused by fractures of the spine due to direct trauma from something such as a car accident. Aging adds to the risk of developing degenerative spondylolisthesis, as the bones and their supporting structures lose fluid and elasticity as part of the normal aging process, making the spine less resilient and more easily damaged. Less common causes of spondylolisthesis are tumors (pathologic spondylolisthesis, which weakens the bones, causing them to slip more easily), birth defects (dysplastic spondylolisthesis) and back surgery. Rest - Taking a break from the activities that led to the condition is usually the first step toward recovery. The application of ice and/or heat is sometimes also recommended. Chiropractic adjustments - A chiropractor can use spinal adjustments to realign the spine above and below the spondylolisthesis, which may be contributing to the condition, and adjust associated joints that may have become misaligned. Chiropractic care is a holistic, non-invasive form of treatment that has been shown to be effective in the treatment of spondylolisthesis. If chiropractic care, which is considered conservative and natural because it uses no foreign chemicals or surgical procedures, does not have the desired result, then medication and surgery can always be used. We recommend chiropractic first, because of the conservative and natural nature. The other reason to try chiropractic first is, if it’s effective, you will avoid the possibility of negative side effects that can come with drugs and surgery. Pain medication - Acetaminopen, NSAIDs such as ibuprofen or oral steroids may be suggested to help decrease inflammation and reduce pain. Exercise/physical therapy - Exercises that involve strengthening the abdominal muscles and the muscles that support the spine can be useful in taking pressure off the lower back, and stretching the hamstrings can help alleviate the tightness and pain in the lower back caused by spondylolisthesis. Surgery - In severe cases of spondylolisthesis, spinal fusion surgery may be necessary if pain has not been alleviated after six months using other forms of treatment. If you think you may have spondylolisthesis, contact your chiropractor as soon as possible so as to avoid the condition becoming any worse. With some appropriate therapeutic treatments, in time, you can once again be pain-free and resume your normal activities.